Just because gardening season in Michigan is about to end, it doesn’t mean that I will stop gardening. Like I said in previous posts, my mind is always in the garden. Not because I want to dig in the dirt, but mostly because I love nature and the beauty it offers. I feel in total awe and hold a true appreciation for how plants grow, providing us with their delicious fruits, roots, and leafy flavors! I guess I mostly garden for the love of food. I took a long weekend trip to southern Florida to visit my daughter and her family. I thought I was taking a vacation from the garden, enjoying the sun, a little swimming, playing with my granddaughter. Both my daughter and son-in-law work and don’t have much time for gardening, but wanted to offset the cost of their grocery bill by trying to grow more of their veggies. Today, my daughter wanted to plant her garden. She had already bought seeds and started some plants in peat pots. She had been gardening in containers and decided it was time to expand her growing space. 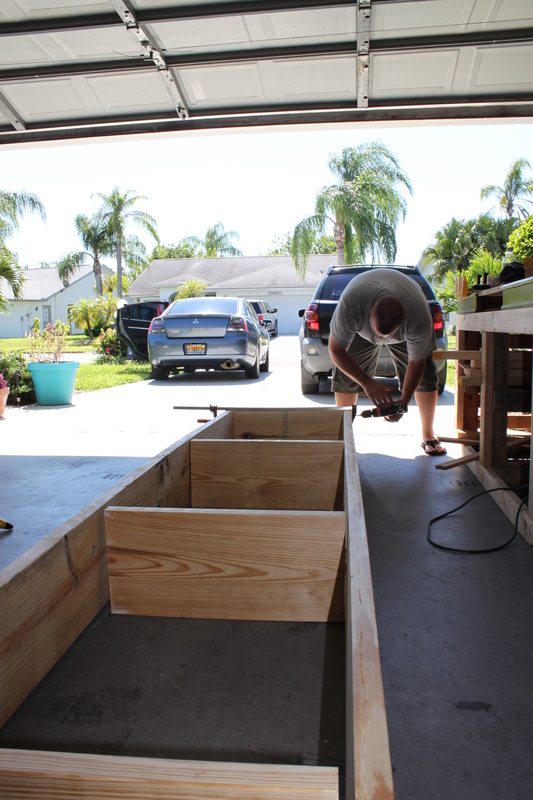 Now is the time to plant in Florida, so we headed to the local box store to buy lumber, topsoil, and a few other supplies to make a veggie garden. 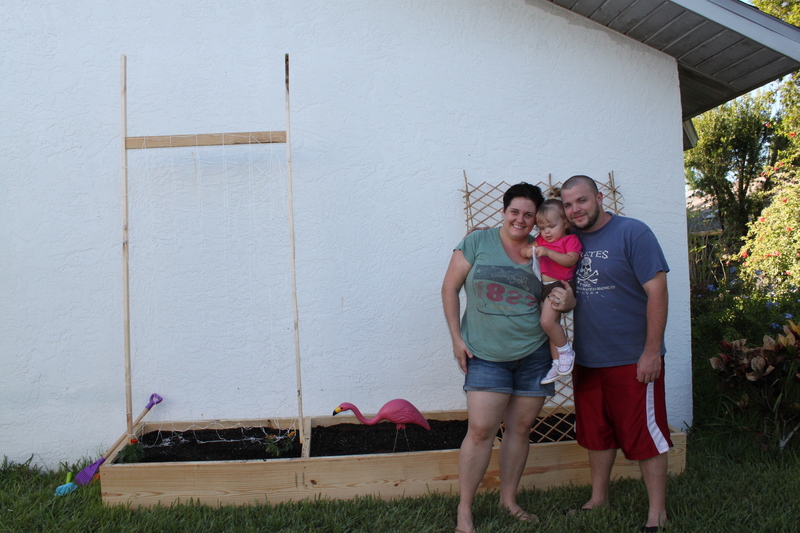 After following directions from the post I wrote on March 18, 2012 Contained Chaos, my daughter and her husband decided on the best location to build their raised bed. The morning is the sunniest on the southeast side of their house and it is totally shaded by 2:00 p.m. Perfect for Florida when the afternoons are really too hot. This will be good for working in the garden later in the evening with their daughter. It didn’t take long before my son-in-law had the bed put together, trellises up, and then both he and my daughter filled them up with topsoil and potting mix. They planted pole beans, zucchini, and cucumbers today as time was running short. 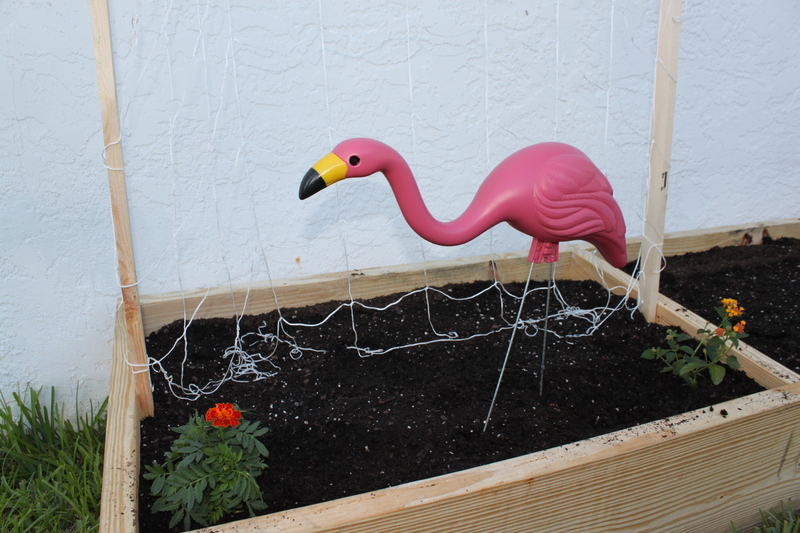 My granddaughter planted the plants she picked out this morning, along with a little tropical bird she fell in love with that adds a little garden whimsy. Ha! My daughter said she would never have one in her yard. Funny what parents (and grandparents!) do for their kids. There should always be a little fun in the garden. It was a good day building and planting as a family. Now I will go home to Michigan, where the leaves have probably fallen off the trees, and where I will finish some garden chores, pruning, cleaning and putting away my garden tools. Next time I visit my daughter and son-in-law may be around the holidays, when I will expect fresh green beans for dinner! As well as the amazing risotto that she makes. Have you planted your garden yet?